NEW ORLEANS —When Pamela Bolton searched for a middle school for her daughter seven years ago, convenience, not college, was on her mind. She ended up enrolling her daughter at a new and untested middle school called New Orleans College Prep largely because she could get there easily. But New Orleans College Prep, and its partner high school, Cohen College Prep, ended up providing much more than an easy commute. Last spring a large poster of Bolton’s daughter, Imani, then a graduating senior, attested to such as it hung in the school hallway. “IMANI HAS OPTIONS,” the poster proclaimed, listing the scholarship awards that Imani had won up to that point: $4,000 to attend Jackson State University; $52,000 to attend Spring Hill College; $56,000 to attend Emory & Henry College; $32,000 for Millsaps College. In the end, Pamela Bolton counted the unexpected help that Imani got in the college admissions process as one of the most important things the school provided.“It was a lot off me because I didn’t know much about it,”said Bolton, a baker at a downtown casino, during an impromptu interview at the school’s college counseling office. She was there filling out paperwork for the University of Louisiana at Lafayette, which her daughter plans to attend on a state-sponsored full scholarship this fall. 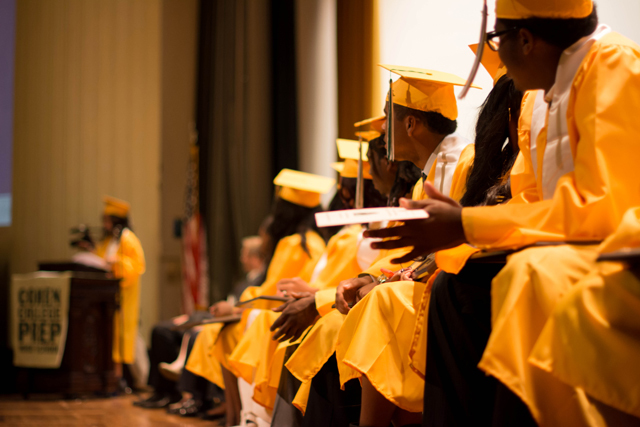 Cohen College Prep’s 100 percent college acceptance rate for the Class of 2014 —its inaugural graduating class —is three times the rate at the old high school the ambitious charter displaced, school officials say. Collectively, the school’s 54 seniors won over $2 million in scholarship aid, more per student than any other open enrollment school in the city, according to an analysis of figures from the Recovery School District, which encompasses most of the city’s public schools. Ben Kleban, the founder and director of New Orleans College Preparatory Academies, the network that runs Cohen College Prep, describes the school’s high college acceptance rate as a “major milestone”made possible by more than seven years of hard work and strategic planning. But the real test will come over the next few years, as the students from Cohen seek to earn their college degrees.Whether they succeed will be part of a crucial reckoning not only for Cohen but more broadly, for the post-Katrina New Orleans school reinvention. This fall, the Recovery School District will be the first big-city school district made up entirely of charter schools, many of them founded on the premise that they could do a better job of sending low-income and first-generation college students to and through college than their public school predecessors. Not everyone is convinced the students from these schools will persist to degrees once free from the watchful eyes of charter school teachers and administrators —and on college campuses where their academic fates will rest in their own hands like never before. Charter schools’ proponents and detractors alike say it’s too early to declare the city’s schools a success or failure when it comes to college success. Destination colleges for Cohen graduates vary widely and include two-year colleges and Historically Black Colleges and Universities, or HBCUs, which often pride themselves on enrolling underprepared students. But they also include highly selective institutions that are as far away culturally and socioeconomically as they are geographically from the violence-prone neighborhoods from which many of Cohen’s students hail —and ardently want to escape. “Ultimately, it takes years to see if a school is successful.”Andre Perry, founding dean of urban education, Davenport University. Cohen College Prep has presented college as the inevitable destination for its students since its inception in 2007, when it opened with just sixth graders and added a grade each year. When they are not wearing their standard uniforms, for instance, students don hooded college sweatshirts. College pennants hang throughout the school, and teachers emphasize the various skills and habits of mind students will have to know once they arrive on campus. For instance, in an Advanced Placement calculus class toward the end of the school year, math teacher Elizabeth Greene chided the students for allowing other staff members to pull them out of her class for end-of-year planning and activities. 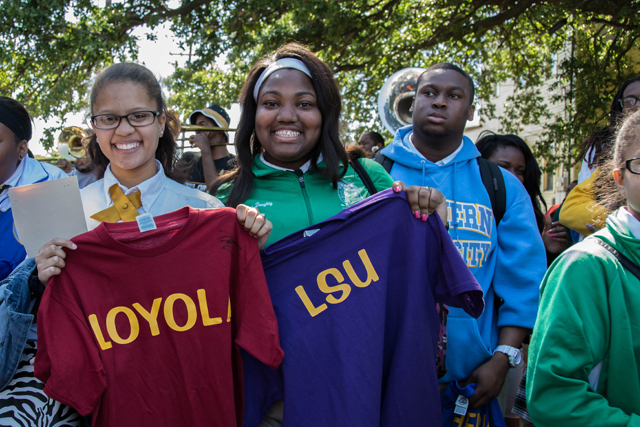 Over time, Cohen College Prep has also put substantial resources behind its college-for-all goal. It has two full-time staff in the college counseling office, a sizable commitment given the relatively small size of the graduating class. One of those counselors is Paris Woods, who started over a year ago as director of alumni relations to advise the students as they progress through college. Woods, a former financial aid and admissions officer at Harvard University, is usually the one who breaks the stark news to students regarding the cost of tuition at some of their top choices for college —and ultimately steers them away from colleges that will leave them saddled with sizable debt. For instance, Pamela Bolton’s daughter, Imani, said she was elated this past spring when she received an acceptance offer from Millsaps, whose biology program she admired. But that elation turned to confusion a month or so later, when the college sent along its financial aid offer promising the $32,000 in scholarship aid. “When I opened it up, I didn’t really understand it,”Imani said. So she brought it to Woods, who explained that Imani could wind up tens of thousands of dollars in debt if she went to Millsaps since the scholarship only covered the equivalent of one year of tuition. “I wasn’t mad but I wasn’t really pleased,”Imani said. She began reconsidering her options, including taking a closer look at public universities in Louisiana where she could get a full state-funded scholarship. That’s why she settled on the University of Louisiana at Lafayette. Although Woods’ primary job is to keep tabs on Cohen’s graduates once they start college —something a number of schools across the nation are doing to ensure their students persist to degrees —she started that work before students’ senior years. “The idea was for me to come in early and build relationships with students because it’s hard to get someone to respond to someone they view as a stranger,”she said. From the start, she drew heavily on her background as a financial aid advisor. When students started to get acceptance letters from colleges, Woods created color-coded Excel charts that helped show students how much they would have to borrow or pay out of pocket to attend a particular school. Woods was also key in prodding virtually all of the students’ parents to fill out the Free Application for Federal Student Aid (known as FAFSA)—a task that is highly correlated with college enrollment. When she couldn’t persuade parents to come in and work with her on it in person, she called them and walked them through the process on the phone and completed the application online. Overall, New Orleans public schools have FAFSA completion rates that fall significantly below the national average. Cohen’s graduating class includes several students bound for faraway —and comparatively foreign —locales. Anton Brown, 19, one of three Cohen students participating in the Bard Early College program in New Orleans, which enables high school juniors and seniors to take college-level courses, is headed to Bates College in Maine. Brown spent a few days on the Bates campus after his college admissions essay got him selected for the school’s “fly-in”visitation program, which is designed to get high-achieving high school juniors who are minorities or the first in their family to attend college acclimated to the environment. He liked the relative calm of the Bates campus, contrasting it to the violence-prone streets of New Orleans. “In New Orleans, you can have someone walking down the street and say, ‘How you doing?’And you don’t even know them and then someone gets shot,” he explained. At Bates, “I felt a really good vibe. I felt like that was a place I’d be comfortable with,”said Brown. Theodore Williams IV, 19, also a Bard Early College student at Cohen, said he never thought about going to college in Wisconsin. But as soon as he set foot on the Beloit College campus, Williams said he became enamored with the school’s small classes and sense of community. The more selective institutions that Cohen graduates will attend all enjoy high black graduation rates. At Bates, for instance, the graduation rate for black students is 86 percent, just shy of the school’s overall graduation rate of 88 percent. At Beloit, the graduation rate for black students is 75 percent, compared to 78 percent for the college overall. Nationally, the average college graduation rate for black students is 39.9 percent, federal data show. Despite Cohen College Prep’s success so far, some experts say the school —and others like it —will face an uphill battle shepherding its alumni through college. “A lot of the reformers think they’re sending kids to prestigious institutions, and they’re putting them from the frying pan into the fire, because the disconnect between schools and colleges is vast,”said Perry, who also writes a column for The Hechinger Report. Perry said it can be particularly difficult for black students from the South to adjust to small, northern towns where most of the residents and students are white and come from very different cultural and socioeconomic backgrounds than the typical Cohen College Prep alum. Marybeth Gasman, a professor of higher education at the University of Pennsylvania, said most highly selective schools have graduation rates that are nearly identical for blacks and whites. “The reason is that most blacks at highly selective schools are not from low-income families,”Gasman said, noting that the percentage of Pell Grant students at Beloit and Bates is relatively low —only 24 and 12 percent, respectively, according to a federal database. “Income and graduate rates correlate more strongly than any other indicator,”Gasman said. Both Brown and Williams are attending college on full scholarships. Not all Cohen College Prep graduates are headed to rigorous, four-year colleges —the school’s stated objective. Of the seniors, 76 percent are bound for four-year universities and 19 percent for two-year colleges. (Two seniors did not graduate on time in the spring; school officials say they are scheduled to graduate in December.) Eighty-one percent are attending school in Louisiana, while 19 percent are headed out of state. Fifteen percent are headed to private colleges and universities, and 28 percent to HBCUs, the school’s figures show. Still, Cohen educators acknowledge that the school faces myriad challenges preparing its students for the culture shock and academic demands of college. For instance, during the 2012-2013 school year, when Cohen began offering an Advanced Placement course in U.S. history, 14 of the 17 students who took the end-of-course exam only scored one out of five on the exam —not high enough to earn college credit. Still, Witkins says he’s glad the students had the experience and believes he’s doing a better job now —a view supported by data, which show that in the 2013-2014 school year, eight of 10 students who took the AP U.S. History exam scored a two, and two scored a four. Most colleges and universities require a score of a three or better for the exams to count for college credit, according to the College Board. Even with the stronger showing this year, Witkins says he worries many students will struggle with writing in particular once they get to college. For some students, “the ability to formulate an argument and even a strong sentence is lacking,”he said. Other similar charter networks have had mixed results at achieving the college graduation records they desire, suggesting Cohen College Prep may struggle as well. The Knowledge is Power Program (or KIPP), for instance, has a college graduation rate of about 44 percent for its alumni (an additional five percent of alumni have completed two-year degrees). That’s significantly higher than the rates for first-generation and minority students nationally, but well below KIPP’s target of 75 percent. The most pressing challenge Cohen College Prep faces in the short-term is avoiding “summer melt”—when students with college plans ultimately fail to enroll in college the fall after they graduate from high school. To limit the melt, Woods said Cohen College Prep is holding a summer bridge program in collaboration with another charter school to build social bonds among students so they can provide support for each other at college in the fall. Starting in August, Woods’ main responsibility will be to track students to see how they are performing in college and help them “problem solve”when academic, financial, or social difficulties arrive. Despite questions about how well Cohen College Prep’s graduates will fare once in college, some parents say they are grateful for how much support the school has provided just to get their children to this point. Bolton, Imani’s mother, credited the school’s teachers with going “above and beyond the call of duty,”tutoring Imani even on the weekends. “Everybody seemed to be there for the children,”she said. She feels fortunate to have followed up with the school representatives who were handing out fliers for the then-fledgling charter school outside her church back in 2007. “I made a good decision,”she said.